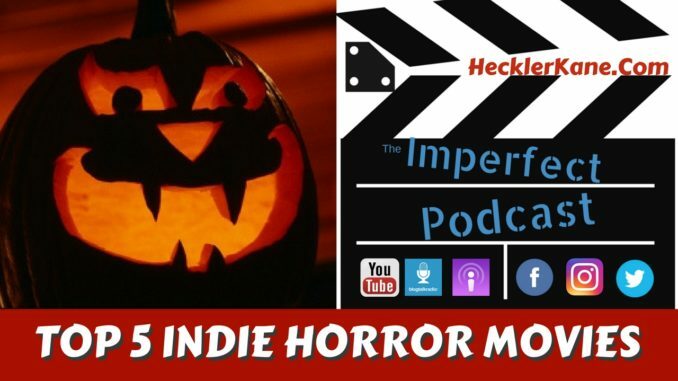 Joe and Sal discuss their favorite indie horror movies to watch on Halloween. We may catch some flack for what’s included as a true indie horror movie. Companies such as Lions Gate are known for their big budget horrors. They hardest part for us was only being able to choose 5! We also find out Joe’s obsession with Bruce Campbell may be cause for concern. All we can say in advance about the list is that Sal and Joe only agreed on two movies but not where they belong on the list. From classics to modern terror, let us know what horror movies you love or who’s picks you disagree with. #5. Hush – Released in 2016 by Intrepid Pictures. Directed by Mike Flanagan. Hush was an official selection at the SXSW Film Festival and it won Best Director at the iHorror Awards and Best Independent Film at the Rando Hatton Classic Horror Awards. After losing her hearing as a teenager, author Maddie Young (Kate Siegel) lives a life of utter isolation and becomes the prey of a psychotic masked killer. This movie is an intense game of cat and mouse as Maddie fights to survive the night! If you want an intense thrill ride that will leave you breathless, watch Hush! #4. The Blair Witch Project – Released in 1999 by Artisan Pictures. Directed by Eduardo Sanchez & Daniel Myrick. There is no doubt this film deserves a spot on the list and was a pioneer of the found footage genre. It cleaned up at the box office and won many awards from Cannes Film Festival to the Razzie Awards. Let’s just say The Blair Witch Project isn’t for everyone but it definitely brings the terror. I’d personally stay clear of the sequel made in 2016. In case you haven’t seen this classic here’s the synopsis. Presented as a straightforward documentary, the film opens with a title card explaining that in 1994, three students went into the Maryland back woods to do a film project on the Blair Witch incidents. These kids were never seen again, and the film you are about to see is from their recovered equipment, found in the woods a year later. #3. Halloween – Released in 1978 by Compass International Pictures. Directed by John Carpenter. Made for an estimated $300,000, John Carpenter’s Halloween doesn’t need much introduction from us. In 1978 a psychotic killer was born, none other than Michael Myers. This movie is likely at the top of many horror best of lists and has been scaring the pants of audiences for decades! It won a number of awards and set the bar for what thriller horror movies should be. Plus, Jamie Lee Curtis! #2. Shaun of the Dead – Released in 2004 by Focus Features. Directed by Edgar Wright. Horror comedy is something that’s near and dear to our hearts. This isn’t going to give you the fright and fear of other horror movie classics but Shaun of the Dead holds it place in history as one the all time greatest. It won two awards for Best Screenplay and grossed over $13 million dollars at the box office. If you’re a fan of Evil Dead, Zombieland or other horror comedy classics, go watch Shaun of the Dead. I guarantee you won’t be disappointed. #1 Saw – Released in 2004 by Lions Gate. Directed by James Wan. Saw marks the directorial debut of James Wan and spawned a new type of horror thriller killer named Jigsaw. Mind bending psychological death machines haunted our nightmares. the Saw franchise of horror is still alive and well today with its latest release called Jigsaw. It combines the best elements of psychological thriller with a slasher film. It won a number of awards including Best Screenplay and took 3rd place at the Fangoria Chainsaw Awards. #5. Nosferatu – Released in 1922. Directed by F.W. Murnau. Black and white, silent films are not what one may think of when it comes to horror movies. To completely understand the genre we must first understand and appreciate where it all began. The performance of actor Max Schreck as the vampire set the bar for all vampire portrayals to come. The found footage classic landed in the same spot on the countdown for both of us. Is the Blair Witch real? At the time, that was a question that was being legitimately asked. Now that the thrill is gone, reboots and sequels haven’t held as much sparkle with audiences. What the directors accomplished with the original film was a major achievement. Shot for a measly $60,000 this horror movie scared the dollars out of many wallets to the tune of $248 million dollars! #3. Evil Dead – Released in 1981 by Newline Cinema. Directed by Sam Raimi. Who can argue with Evil Dead? What’s not to love? Shot for $350,000, Bruce Campbell and the directorial feature debut of Sam Raimi it has all the elements of a zombie movie you could ask for and more. Arguably, more people fell in love with Evil Dead 2 which is rare for any sequel but Joe loves his classics and you have to give him kudos for making sure Evil Dead got their props. Now if we could only get Bruce Campbell on our podcast! Which do you like better? Evil Dead or Evil Dead 2? #2. Texas Chainsaw Massacre – Released in 1974 by Bryanston Pictures. Directed by Tobe Hooper. Texas Chainsaw Massacre was a game changer in the slasher horror movie genre. Leatherface and his thirst for human flesh paved the way for horror legends and psycho killers including Michael Myers, Jigsaw, Jason, Freddy and many others we didn’t get to include in our list. If you’ve missed out on this classic, you’re missing out. Period. #1. Halloween – Released in 1978 by Compass International Pictures. Directed by John Carpenter. Halloween is the classic horror movie that has been the inspiration for many horror filmmakers. Already mentioned in Sal’s list, I don’t think anyone can argue putting Halloween in the top spot. As discussed on the podcast, we’ve both watched the Rob Zombie Halloween remake and think he did a phenomenal job capture the horror and nuance of this psychological slasher thriller. I’ve been a big fan of Rob Zombie’s film work and The Devil’s Rejects is one of the films that got an honorable mention from Sal.